Throughout hockey history, goalie masks have always been an important part of each goaltender’s character. 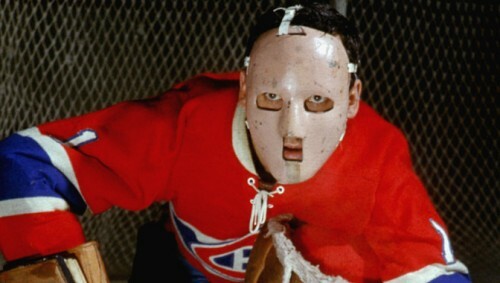 From the very first mask worn by Jacques Plante in 1959, to the mask/helmet combination worn today, each mask is uniquely created by the wearer. Here are a few masks that stand out in the long succession of hockey goalies. USA! USA! USA! 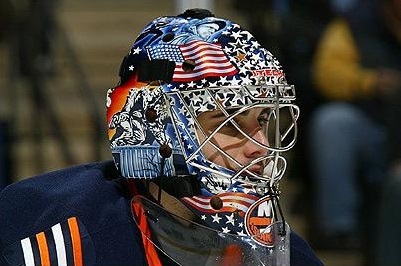 Although no longer with the Islanders, this specific goalie mask was worth mentioning for it’s patriotic paint. Now retired, but once a member of the Stanley Cup winning Tampa Bay team, John Grahame’s mask is notable for it’s NASCAR-themed designs. The flashy paint and scantily clad women on either side of the cage make for a mask not likely forgotten. Winner of the Conn Smythe Trophy in 2003 and the Stanley Cup in 2007 with the Anaheim Ducks. 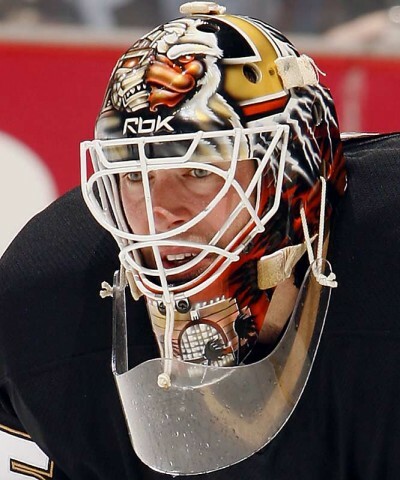 His mask possesses one of the scariest ducks I’ve ever seen, and remains a notable part of his time with the Ducks. 7. Jason Bacashihua or Jason Voorhees? Freddy vs. Jason. A terribly campy movie, but still the stuff nightmares are made of. 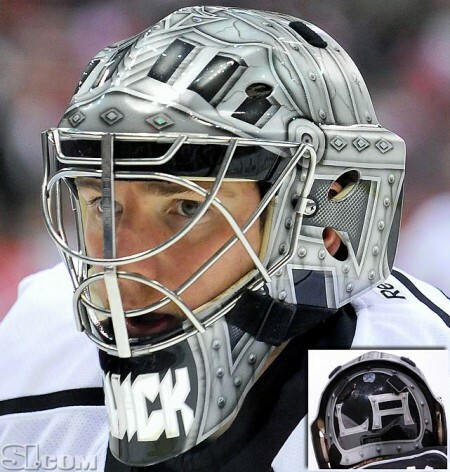 And what better way to intimidate the opponent than by designing his goalie mask after two famous movie murderers. Although his time playing with the St. Louis Blues was brief, his mask deserves recognition. Mike Smith isn’t just the owner of a cleverly designed hockey mask. He boasts a gold medal from the recent Winter Olympics, playing with the Canadian team. He is also one of 11 goaltenders in NHL history to score a goal. 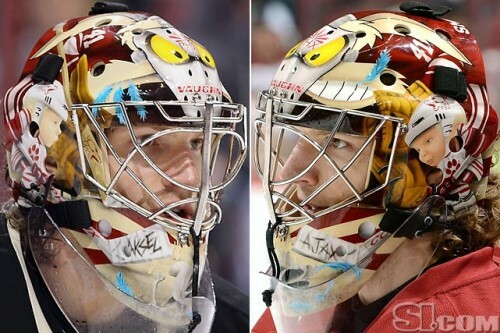 And with Wile E. Coyote dominating his mask, you can be sure Smith still has a few tricks up his sleeves with Phoenix. Quick’s goalie mask may seem simple compared to more flashy styles, but it suits him and his team perfectly. The mask is designed to look like armor for that of a knight, with colors blending right into the Kings‘ uniforms. Formidable and unassuming. 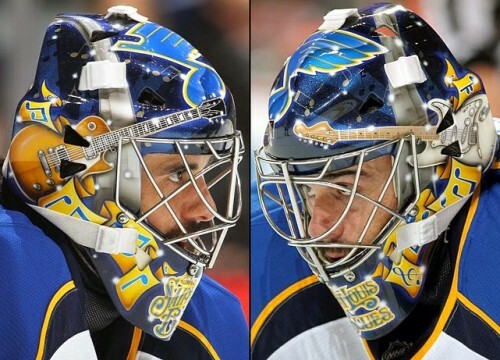 Ryan Miller’s recent stint with the St. Louis Blues may not have lasted long, but fans definitely appreciated his St. Louis-themed goalie mask. 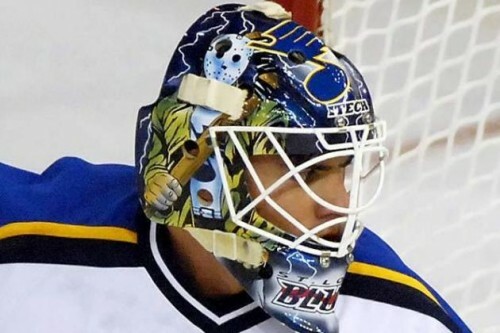 Sporting the famous guitars of Jimi Hendrix and Jimmy Page, as well as the St. Louis Arch, Miller’s mask was also a nod to the famous Blues Goaltender Curtis “Cujo” Joseph. 3. Who You Gonna Call? Cam Talbot! Currently playing with the Rangers in the Stanley Cup Finals, Talbot sports a goalie mask anyone could recognize. Because really, who doesn’t like the movie Ghostbusters? 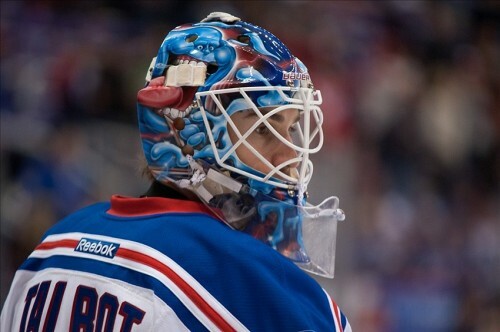 Sporting the iconic, slobbering ghost that “slimes” the boys on their first job, Cam Talbot’s mask looks good on the ice. Now…who you gonna call? Aptly nicknamed Gary “Bones” Bromley, his terrifying mask features the skeletal face of something fearful. 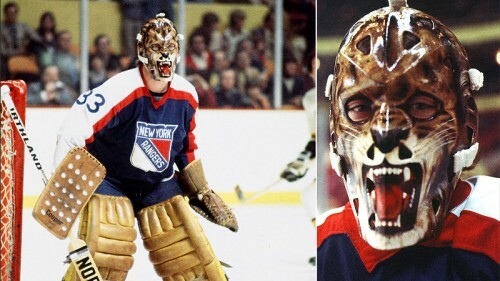 If you want to scare your opponents and your fans, style your next mask like Gary Bromley’s. Gratton was known for strange behavior on and off the ice. Nicknamed “Gratoony the Loony,” it’s no wonder his mask ranks highest on the creepy scale. There’s no other mask like this one, and no other guy like Gilles Gratton. 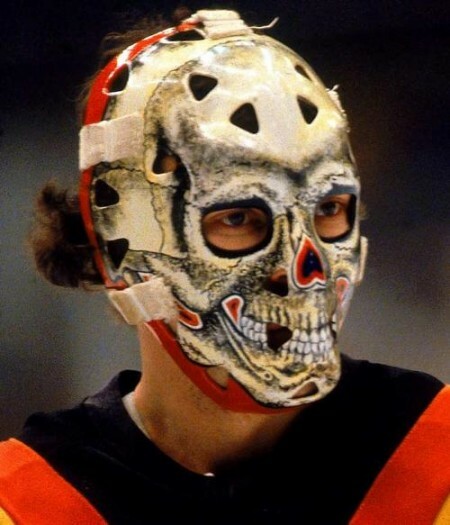 Don't forget about Steve Masons two masks from the Philadelphia Flyers!